Newer 4 bedroom, 3 bath home just 5 minutes from Walt Disney World with hot tub, wireless hi-speed internet access--top of the line accommodations. Make Minnie Heaven your place of solitude after a long day at the parks, golf course or outlet stores. Our home is very quiet, comfortable, clean and attractive. This home is also rather new, being built recently in 2003. It is located in the exclusive Indian Creek development, a group of homes located just minutes away from Walt Disney World, shopping, golf, restaurants and everything else the Orlando area has to offer. We got into this business after being customers ourselves. 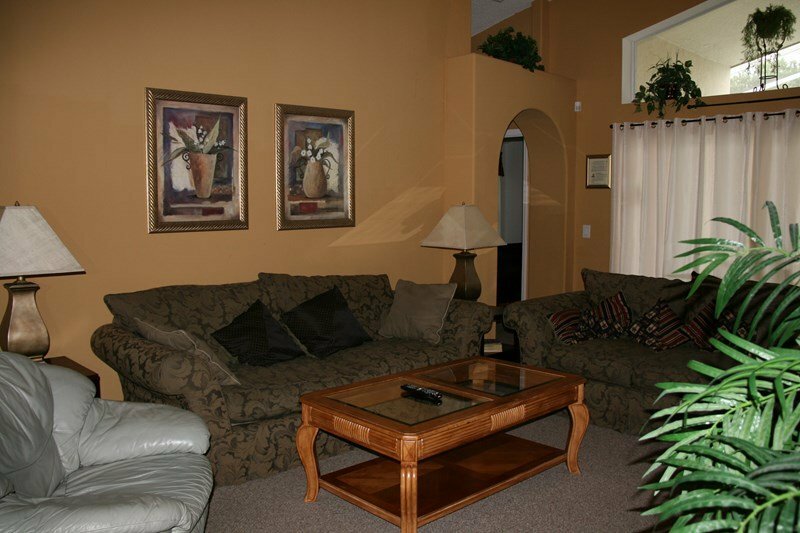 We duplicated what we enjoyed and added the amenities we desired from our visit to Orlando as vacation home renters. We have taken extra special care to personally decorate and equip Minnie Heaven to the standards you desire for a place you will call home during your Orlando stay. accommodations that will allow you to relax and recharge your batteries for the next day of adventure. One master suite has a King bed, en-suite bathroom and access to the pool area. The second master has a Queen bed and its own private bath. The King master has its own television with Brighthouse Digital cable programming. The other two bedrooms have a full size bed in one and two twin beds in the other sharing a full bath. There is also a Nintendo 64 system with plenty of games to keep the young ones entertained when you are not out at the parks. The family room television is equipped with Brighthouse Digital cable programming with a Digital Video Recorder (pause, rewind, fast forward or record programs to watch later). A combo DVD/VCR player is also provided. The screened-in patio/pool area gets ample sun. The lanai is a great place for relaxing, reading, conversing or eating prior to taking a dip in the pool. Another great feature of this area is the Spa that spills into the pool. The lanai has a table and comfortable lounge chairs. There is a gas grill in the lanai for your use at no additional cost. The kitchen has everything you need to prepare your meals or reheat the leftovers from the previous evening's dining. The home has a washer and dryer. All towels and bed linens are provided. There is a pack-n-play portable crib at the home for your use--no charge.